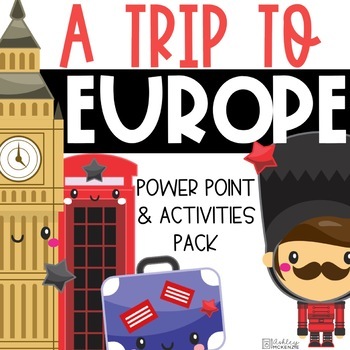 A Trip To Europe Power Point & Activities Pack! Continents & Countries Studies Bundle- Power points & Activities! 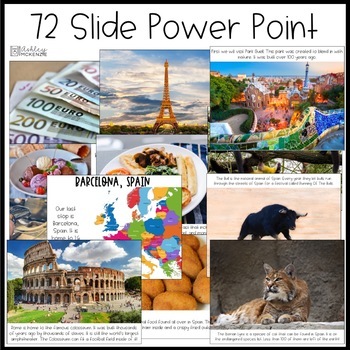 - this power point visits Paris, Rome, London, & Barcelona specifically. Make a Match - Students match the Spanish word to English word. This is a very cute and no-prep craftivity to display their knowledge of what they learned on their trip. It includes 2 prompts and 8 Toppers to choose from. Your students will love having their very own ticket! All you have to do is print, fill in their names and you are done! 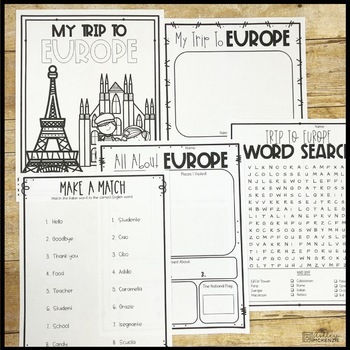 I love to teach my students about different places around the world and Europe is such a fun one! I get them excited by telling them I am taking them on a trip to Europe and I set the classroom up like the inside of an airplane by moving all the desks to one side and setting the chairs up into rows facing the board where I show the power point. Sometimes I even get a recording of the sound of a plane taking off and we pretend to fly! -I provide snacks on the plane like peanuts and sprite while we fly. 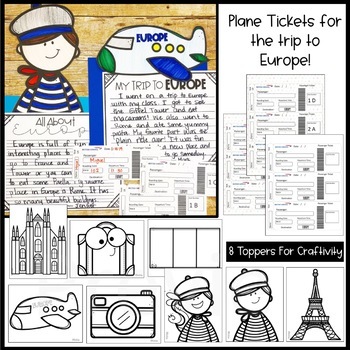 Hand them their ticket the night before to keep in their passport book and they will be dying to come back to school the next day! You can even have them "earn" their ticket with good behavior! -You can also give them a taste of the foods shown in the power point. It's fun to see kiddos try different kinds of food! :) You can set up a "Taste of Europe" table where they can try new food! I hope you and your class enjoy this! Please leave feedback and let me know how it goes!